The following Certificate Authorities provide free DV (Domain Validated) certificates. letsencrypt.org is a free, automated and open Certificate Authority operated by Internet Security Research Group (ISRG). The free DV certificates from letsencrypt.org are valid for 90 days and can be renewed easily and recognized by all the major browsers such as Firefox, Chrome and Internet Explorer. Learn how to get a free certificate from Let's Encrypt at Getting started guide. There are many web hosting providers who provide built-in support for the installation of a Let's Encrypt's certificate. Check out the list of hosting providers who support let's encrypt. 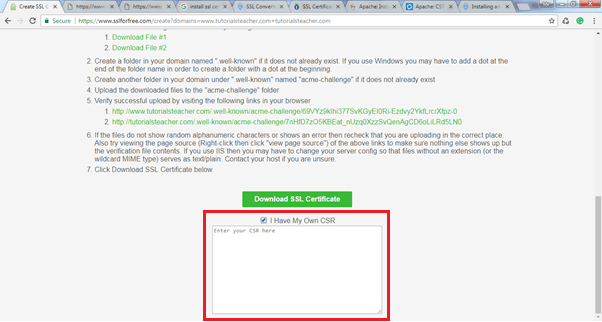 If your hosting provider does not support a Let's Encrypt certificate and you find it difficult to get a certificate manually using Certbot, then you can go to sslforfree.com. This website generates a free certificate using Let's Encrypt's ACME server by using domain validation. It is 100% safe to get a free certificate from sslforfree.com. 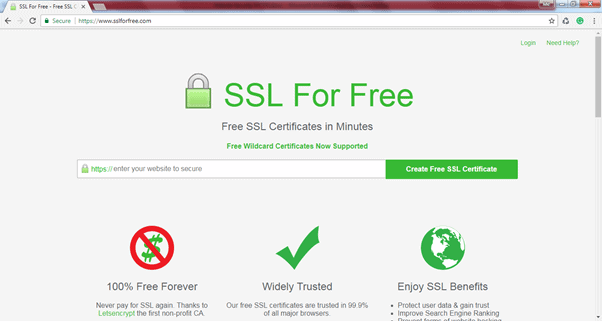 Let's see how to get a free SSL certificate from sslforfree.com. Open https://www.sslforfree.com in Google Chrome browser. It will display the web page as below. In the text box, enter the fully qualified domain name of your website e.g. www.tutorialsteacher.com. Click on the Create Free SSL Certificate button. This will go to the validation page where you need to verify that you control the specified domain, as shown below. Your domain can be validated in three ways: Automatic FTP Verification, Manual Verification by uploading verification file to your domain or Manual Verification by adding TXT records to your DNS server. Select a feasible method to validate your domain. 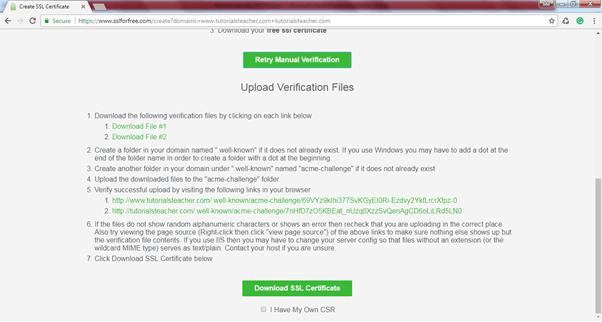 For example, select the Manual Verification method where you need to upload verification files, as shown below. Once you selected the verification method, select the Manually Verify Domain button. This will display further information on how to download and upload verification files to your hosting server, as shown below. After you successfully completed the verification process listed above, you can download the SSL certificate by clicking on the Download SSL Certificate button. If you have a generated CSR from your web server, then select the I Have My Own CSR checkbox. This will display a textbox to copy and paste your CSR and then click on Download SSL Certificate button. 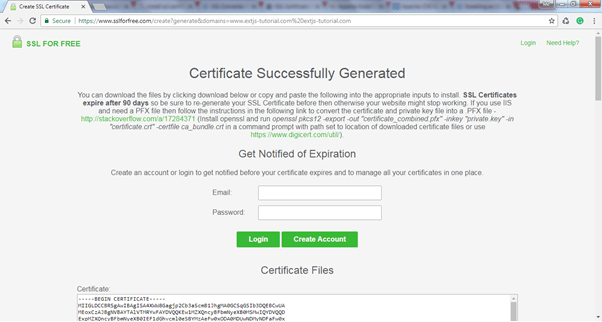 This will generate the certificates and display the page shown below. 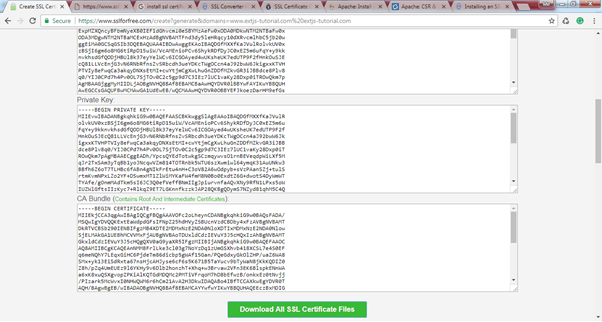 Scroll down to see your certificate, private key and CA bundle (root and intermediate certificates), as shown below. As you can see above, your certificate and intermediate certificate are issued in .crt files and the private key in a .key file. 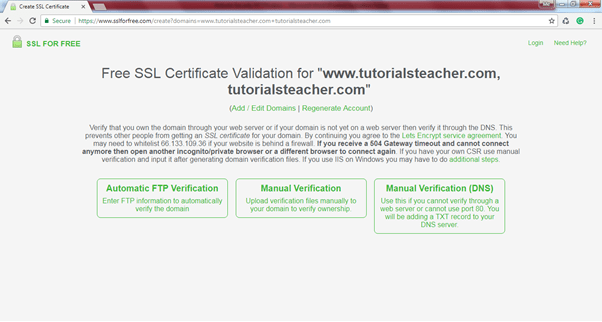 Once you get your certificate, you need to install it on your web server. The installation of an SSL certificate on the web server depends on the OS and the web server you are using. Before the installation, you need to understand the certificate formats and file extensions. Learn how to buy an SSL certificate in the next chapter.